DevilBiss Fuel Tanks: We have replacement fuel tanks for your DevilBiss small engine equipment. 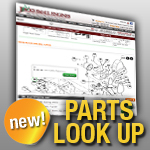 Refer to the fits model section in the parts below to see if the tank will fit your model. PORTER CABLE : BSI525-W Type 0/1, BSI550-W Type 0/1/2/3, BSV750-W Type 0/1/2/3 and more. DEVILBISS : GBFE6010 Type 0/1, GHV4250C Type 0/1, T525 Type 0, T550-W Type 0, BS500 Type 0, BS525-W Type 0 and more.